Tis the season for setting up goals, ambitions, plots and plans for 2012. I recently saw an Agnes & Phil cartoon where the answer to "What is a New Year's Resolution?" was "A to-do list for the first week of January." That's not my plan for this year. On Afford Anything, a personal finance blog that I enjoy reading, Paula recently wrote a post entitled Pick a New Year's Resolution That Won't Fail. The key point with any goal (or resolution) is that you have to pick something that you want enough. She writes about her time traveling the world - that experience was non-negotiable, so she focused her time, energy and money towards that goal. There's a reason that I travel for fun so often. It is more important than a new car, a flatscreen TV, or expensive clothes. It's my priority and that's where my focus lies. The other thing about goals is that you have to pick some that are attainable sooner than others. If every goal you have will manifest itself in 2014, you're going to have a long wait over the next two years. A balance of long and short term goals helps keep you motivated because you'll see some results sooner. 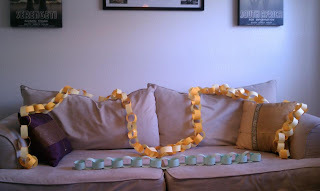 So what's with the paper chains? The short green one is the count down to my birthday, courtesy of my sister. The long yellow and gold one is the count down to our family vacation to Greece. The wait is easier with a visible way to count down to the fun. The nickname for the countdown to Greece chain is 95 days to glory. Aka, our short-term goal for this spring. We have committed to ramped up fitness, food journals and streamlined nutrition (as our trainer would say) with the goal of getting into Greece shape. This is a short-term goal. I can resist cookies in the employee cafeteria for 95 days. I can commit to getting exercise 4-5 days per week for 95 days. I can focus on making healthy dinners instead of decadent desserts for 95 days. I will try to keep you posted on our progress towards glory. All I know is that when I'm relaxing on the islands in April I want to be rocking sundresses like I mean it. And......go!